Provincial transit agency Metrolinx has announced it will be teaming up with VIA Rail for the construction of a new $12-million train station. The station will sit on the same site as the current one and is slated for completion in 2017. 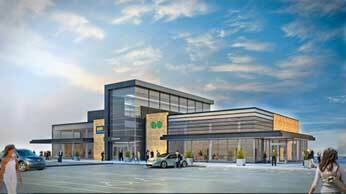 By 2017, Oshawa commuters will have a new train station to come to. Metrolinx, the province’s public transit agency, and VIA Rail have announced they will be teaming up to build a new train station. The $12-million project will be built on the same site as the current station. “They’re modernizing the GO and VIA station to make it more convenient for customers, to take transit while accommodating a growing demand. It’s one of our busiest GO stations,” Anne Marie Aikens, a spokesperson for Metrolinx, tells The Oshawa Express. Plans for the new station include a canopy which will connect the station with the VIA Rail train platforms and improving the kiss and ride area to make it easier for passengers to be dropped off and picked up. In the mean time, while the new station is under construction, the current one will remain in use. Aikens adds that getting a new station in place for Oshawa was important for Metrolinx, as it is one of the busiest stations on the Lakeshore East line, with approximately 7,850 passengers – or about 16 per cent of the line’s communters – using the station every day. Meanwhile, plans are ongoing for the line to extend further east toward Bowmanville. The proposed extension would see another station be built in Oshawa on the site of the former Knob Hill Farms property. Metrolinx expropriated the land in July 2014. “The upgrades at the Oshawa station doesn’t preclude any other expansion of services, for example, to Bowmanville. That is still in our plans, but we don’t have funding to announce for that yet,” Aikens says.